Claudio said: "Any Amount of Books has the feel of a great second hand/antique book dealer and wonderful selections of everything and they have tons of fresh stock every week so you're bound to always find something even if it isn't the thing you were looking for -- particularly good are the classical lit (as in Ancient Greek, Latin translations) and Lit Crit (Which is always stocked with good quality general reading and study material)." 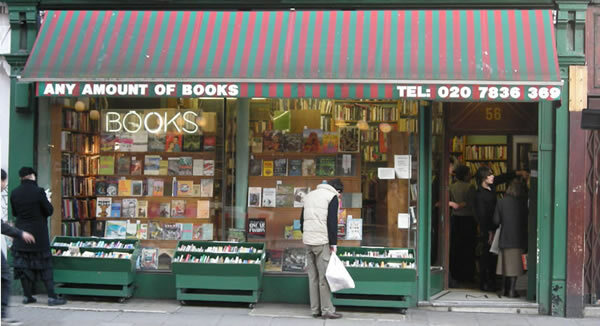 This bookshop is located in the heart of London's busy social and cultural (read: bookshopping) life, on the famous Charing Cross Road, some 50 meters from Leicester Square station and within walking distance to Soho and Piccadilly - which makes us wonder, how come it took almost 4 years for someone to recommend us this gem? 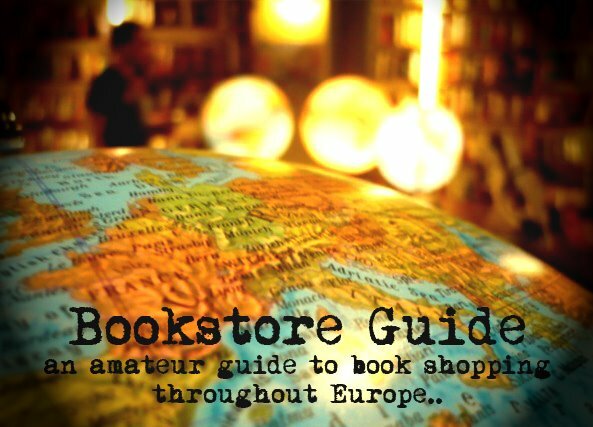 Any Amount of Books seems to be a cult bookstore, known in the whole of England (and beyond). With a stock of thousands of books, the prices range from literally £1 up to thousands of pounds for those really special and hard to come across pieces of literature. Needless to add, categories of books include everything from modern literature, art, poetry and academic books to rare first editions, antiquarian and leather bound sets. The basement is where you'll find the "cheaper and more down to earth" stuff, while the valuables reside upstairs. What we particularly like about this shop is that they do not have an online store, i.e. 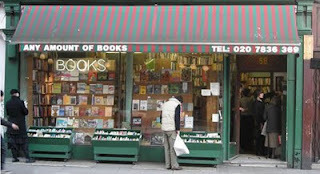 you can only buy a book by being in there in person - hence the long working hours seven days a week. Any Amount of Books also want your books - therefore, if you have an old encyclopedia or a first edition that you inherited from your great great uncle and it just doesn't look good in your state of the art zen living room, let the people at Any Amount know you have some goodies for them. Surely they'll appreciate it and you could get some modern coffee table books (together with some cash) in return. Just a little n.b. 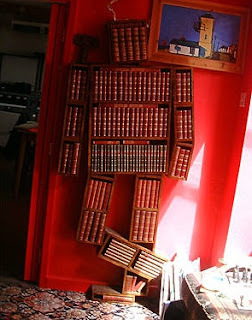 at the very end, check out the designer bookshelves at Any Amount of Books - they're in the shape of a man and are highly decorative pieces of furniture as well as sculptures (and would look great in your zen living room!). They are sort of pricey but worth every penny because you'll probably be the only one in your neighborhood with the Bookman.